I’ve been meaning to write a post for the past few months on the select group of things I actually enjoy over email. I still go through 100 or so messages every day and most of them are either things I ignore or things that require attention and work from me, leaving very few that I look forward to and enjoy. I put this post off for so long that Jason Kottke already wrote about one of those beloved emails, the weekly Quora email. Just to build on what Jason already wrote, by a fluke of weird Facebook integration, I have two separate accounts at Quora (I asked, but they can’t be merged) listed as Matt Haughey and Matthew Haughey, one of those having more of my personal hobbies in the profile. I get two weekly emails instead of one and as a result, I can kind of see what is happening behind the scenes. At least half of the email contents are identical. I suspect they are plucking questions from their popular pile and they’re almost always intriguing. The rest stick to personal subjects and here’s where I am continually impressed. One of my accounts has “cycling” attached to it and I get really niche questions about bike racing, training, and equipment, sometimes with only 1-2 answers and they are fascinating and I’m amazed at how well they are at digging up niche content I want to read about. My other account skews more towards technical web development questions and those are often quite good as well. I’m kind of in awe about how they do so well with an automated message each week, I’d be curious to know what kind of technology and workflow they’ve built to make the weekly emails so good. The other email I look forward to is a daily digest of links culled from my Twitter followers by Percolate. Here’s what a typical day’s email looks like. I follow about 500 people on Twitter, and this site automatically figures out not just what links my friends talked about the most, but also the most interesting links that only 1 or 2 people linked to from Twitter. I don’t know how they’re doing this on the backend, but since most days I don’t have time to read an entire 24hrs of my timeline at Twitter, this is a nice fall back of interesting links shared by my friends. Lastly, I like getting Dave Pell’s NextDraft each afternoon. It’s basically a general interest blog (that doesn’t exist as a blog online) delivered by email and it’s a good overview of what the internet is currently interested in and/or freaking out about. There’s also a dose of pop culture stuff I would completely miss otherwise. Those are the three emails I love getting every so often. I haven’t yet subscribed to Evening Edition or The Brief, even though I’ve heard good things about both summaries-via-email services. I wrote up my favorite technology bits of 2012 over at Medium (Medium itself should have made my list, it’s quickly becoming my favorite place to write longer pieces). With the recent news of a new version of the smart thermostat Nest coming out, I figured I should finally write up what it has been like living with the first version of the product since last November, when mine arrived. Overall, it's been a great little tool, smart in lots of smart ways and dumb in just a very few and eons ahead of similar products I've used. Back in the early 2000s, I spent some time in my first house trying to automate everything. I used x10 to control my lights and set up schedules to turn lights on and off at certain times and I bought a programmable thermostat in the hopes of not only saving energy but also allowing me to wake up to a pre-warmed house in the winter. I recall how quickly my adoration with home automation faded when I decided to stay up 15 minutes later than normal only to have the entire downstairs lighting shut off to pitch black per the schedule I created. I also remember spending hours programming the thermostat with complicated weekday versus weekend programs, and how after a couple months I just gave up and used it like a normal thermostat that sat at fixed temperatures. When I heard about the Nest, I immediately ordered one and patiently waited the months until it arrived. It came with a free professional installation that would be scheduled a couple weeks later, but I decided to try it myself and like my last house it was pretty easy to do and 20 minutes after I started, everything was running and it was downloading software updates from wifi (pictured above). After about a week of using the thermostat to adjust temps (fun bonus: cranking up the heat on a cold December morning from the comfort of your bed, using the Nest iPhone app), it started to realize our patterns and follow them (I rarely have to run the iPhone app these days). It was a nice change from the hours of programming I did in the past and it just seemed to work for my family, realizing that we woke up around 7am most days, went to sleep around 11pm, and started shutting itself off whenever we were gone for the day. After about a month, I went onto the Nest.com website to check the schedule and it only required a minor amount of tweaking to follow a perfect pattern. Let me say straight up that the motion sensor in it is pretty amazing. It realizes when no one has been home for a couple hours and sets your thermostat to auto-away mode, saving energy by going to prescribed temp extremes (colder than normal in winter, warmer than normal in summer). I've never had it go to auto-away while I was home working even though it's in a different room. I should also say that if I had a normal office job, the Nest would be doing an even better job. I'm at home about five days a week so it doesn't get tripped into away mode as often as typical houses where most people are gone during the daytime weekday hours. It's hard to say what the bottom line is on energy savings for me. I don't watch our electric bills super closely and our bill includes charges for water too (which usage fluctuates wildly), making quantifying the post-Nest world a bit tougher, but I do know the system goes into auto-away mode reliably several times a week and it's been great to set the whole system to away mode when we've been on vacation. Having a vacant house heated and air conditioned is a lot like running your lawn sprinklers during a rainstorm, a total waste of money. It's also great to have the iPhone/web connections to control it even though I don't need it very often. I remember bringing up the phone app and taking the house out of away mode at the airport when we landed from a vacation, and arriving to a cool house in the summer an hour later. About the only downsides are how it sometimes acts a bit too eager to please. You might have a dinner party and turn on the air conditioning a few degrees cooler than normal to keep guests comfortable, and the thermostat is supposed to ignore one-off moments like this, but I found it slightly adjusting itself at odd times that reflected short term changes. This also happened when I left the country for a week while the rest of my family stayed behind, introducing a new schedule where I wasn't home all week in my home office that had to be adjusted later when I went back to my old schedule. Apart from those minor schedule nits, the Nest has been great, warming the house on winter mornings, shutting down each night about an hour before we typically go to sleep, following our coming and going patterns appropriately and being completely controllable in real time from either the web or our phones (and also by the nice weighty dial on the unit itself) if we need to change things. I won't be buying a new one (for the same reasons Marco states here the software updates make getting a new one unnecessary) but I can wholeheartedly recommend it to all my friends as a neat way to save a bit of energy and turn a dumb appliance like your heating and air conditioning into an automatically configured smart object that works with your own patterns of behavior. 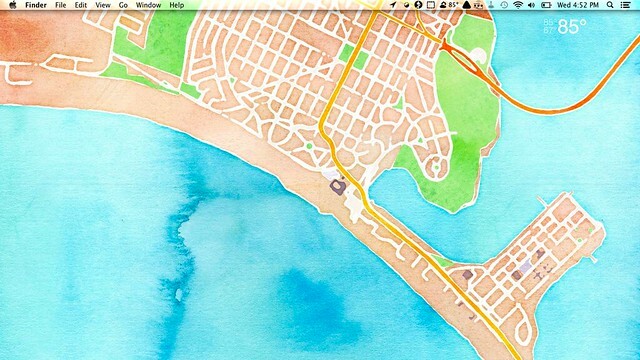 The app Satellite Eyes is a great little addition to any traveler's mac laptop. It automatically figures out your location then fetches map tiles of where you are located at that moment, and makes them your desktop background. It offers several options of mapping, either full satellite photos, terrain maps, simplified black and white line maps, and finally watercolor. Watercolor is the killer part of the app here. It was already a beautiful option that could be used in interesting ways when added to Open Street Maps a few months ago, but it's truly amazing when you are traveling and you get an unexpected gorgeous desktop out of it like the one pictured above. Last week, I opened my laptop up at the Hotel del Coronado in San Diego, California and took a screenshot. I love it when software offers unexpected delights such as this one and I can't recommend this app enough for those on the go (on a desktop it will never change which is a bit blah). Oh, and I'm using the app WeatherMin (also download worthy) to display the outside temp on the desktop in the screenshot above. For the last year I've been using my friend Ben's app Sendtab to manage all the different places I find interesting content. He originally built it as a way to send anything from his laptop to a mac mini attached to his home TV (he cut cable and was constantly watching online video). I started using it soon after it was built and it's become a killer app, as I use it every day on at least three devices. I mostly blame Twitter for this very First World Problem, but I read Twitter each morning on my iPhone when I'm slowly getting out of bed. As Twitter has replaced tools like Delicious for link sharing, I've found friends sharing interesting links, articles, products, etc almost every morning. 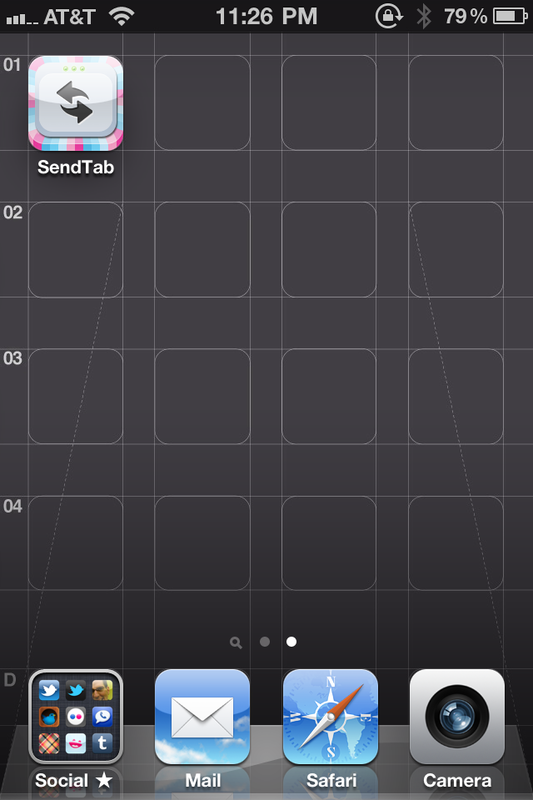 Whenever I think "wow, I need to check that out later on my Mac after I get up" I use Sendtab. Same goes for viewing Twitter on an iPad (especially if the link leads to some flash content I can't view right then and there). Sendtab is a pretty simple thing, you just click a bookmarklet or copy a URL to an iOS app and you can save a URL to your pile to view later on other devices (and you can optionally direct it at a specific device). Why is this useful? For me, I can move anything interesting from my iPhone to my desktop computer and view it hours later. I've also got a GoogleTV attached to my living room TV so when someone points out an hour long lecture worth watching or a hilarious YouTube video I want to show my family, I save those to SendTab as well, pulling them up on my TV via GoogleTV's home screen bookmarks. I know Instapaper is a good app for tracking articles among many devices, and Boxee enables you to "watch later" any video you find online, but I find SendTab is a nice simple silo for tossing everything interesting I want to check out on some other device. It's also handy for "I'm going out the door to the airport and want to keep reading that NYT article I'm halfway through" by letting you send links to specific named devices (the iOS app can fetch these and bounce directly to the URL). To date it's been a simple web app. Ben recently put out a real iOS version of it as well for 99 cents. I also use the Sendtab extension for Chrome that adds a nice big Sendtab button to my browser. If you read/watch the internet on a variety of devices throughout your day, check out Sendtab, it's good simple software that does exactly what it was designed for. The Internet's Pal Adam released this new commercial today for Warby Parker, the hip online eyeglasses company. Four short years ago I wrote a guide to finding cheap eyeglasses online, and one of my principal takeaways was that for most cheap eyewear sites, you have to wade through hundreds-to-thousands of options trying to find something cool. My tips certainly help, but it's still quite a bit of work to find something good and you are risking a few bucks on an unknown. A couple years ago, a friend (can't remember who, perhaps Lane Becker? Anil Dash?) said the next big wave in business was "becoming the Zappos of anything." What they meant was even though there may be a crowded market for whatever is sold online, the market is ripe for someone to come in and provide the absolute best experience possible backed by great customer service. I tried out Warby Parker last summer and loved it, buying two pairs of glasses I wear to this day. I've been meaning to write up my experiences with it ever since. Adam's commercial reminded me that I should write it up. It's as if the people behind Warby Parker looked at every weakness in the online glasses buying process and came up with a solution, turning the whole thing into a positive. The selection feels (I hate to use the word, but it is apt) curated. Instead of offering 500 options, there are about 25 and they're all pretty cool looking. The 5 pair try-it-on offer is terrific, letting you pick from all their styles to see what actually fits your face before you commit to buying them. The try-on is also free, which is incredible. Finally, when you do buy a pair, it's a decent price about half to one-third of what a nice eyeglasses shop would charge, and you get great customer service in the form of personal emails to you letting you know when they are made and shipped, and they check up on you after get them to make sure you are happy. Every single bummer thing about my original eyeglasses article is solved by Warby Parker, plain and simple (oh, and they donate a pair to charity when you buy a pair on top of everything else). Last year I picked out three or four different designs I thought were all hits, but after I got the try-on pack, only one frame looked right and was the right size. It fit me so perfectly I bought two pairs in different frame colors and I recently scratched my favorite pair right across my normal eye path so I have switched to the second backup pair since. I would say in the future, I can't see buying glasses online from anywhere else (the added price of $95 versus maybe $40 elsewhere is totally worth it for the time-savings), especially since they started opening showrooms in a few select cities. The try-on pack was pretty fast, but it was a small pain to mail it back in, and I can't wait to try on every design quickly in their store. Warby Parker didn't give me money to say this, didn't give me anything for free, and never even gave me a discount. I tried them on a whim last year and I've been nothing but satisfied ever since. They truly are the Zappos of eyewear and totally worth checking out. Last fall, I bought a Tiko iPhone/iPod holder to prop up my iPhone while playing movies on planes, after hearing about it on Not Martha. On my way out on the last trip, I decided to throw this barely-larger-than-a-business-card holder in my backpack in case I needed it. After a cross country trip where I watched about five hours of video on my iPad, I’m happy to report that this designed-for-iPhone stand is barely heavy duty enough to work for holding an iPad on a airplane tray table. Here’s a shot of it holding my iPad on a desk. Best ten bucks I ever spent. Love for the Napoleon jacket, originally uploaded by mathowie. In the past few months, I’ve become the proud owner of two jackets with a new-to-me feature called the Napoleon pocket. Obviously, it’s named after the dude and his famous pose of having one hand halfway obscured into his clothing and it’s becoming more common on hiking and cycling jackets. If you stash one in the pocket and then wrap half of your headphone cord around your device, there’s a perfect amount of headphone cord sticking out, but not so much that it gets stuck in everything. You can put on and take off messenger bags, you can fall asleep in an airplane seat, and you can stand in a super crowded subway car without ever getting tangled up in a huge cord. I’ve also found the pocket handy when getting to an airport or grabbing a rental car because it’s a great temporary pocket you won’t forget about and that you can quickly find again without having to dig through other stuff. I don’t know what I’m going to do this summer when it’s too warm to wear a jacket as I’m getting daily use out of this feature. I’ve been hoping that someone was working on using the iPhone browser as a media controller and when I saw Signal, I decided to give it a try. It works like this: you install the app and it runs an internal webserver that you connect to using safari on the iPhone. Whatever is running in iTunes on your computer shows up on the phone exactly as if it was in the iPod mode (with album art, controls, etc). So if you have an airport express hooked up to a stereo, you point your iTunes at the speakers and start playing some music, then walk away from your computer. Once you pull up Signal in your phone, you can control your entire iTunes library remotely. You can pick playlists, set them to shuffle, change to specific songs, try different genres, even pull up podcasts and video. The interface on the iPhone is really what sells it — it looks and functions exactly like a real iPhone app, but it’s all in safari. It’s really quite amazing and turns the phone into a whole house audio remote for me. After my initial problems, I got a new iPhone from my nearby Apple store and spent several hours using it. My first reaction is that it’s very good, meeting the almost impossible expectations I had for it. 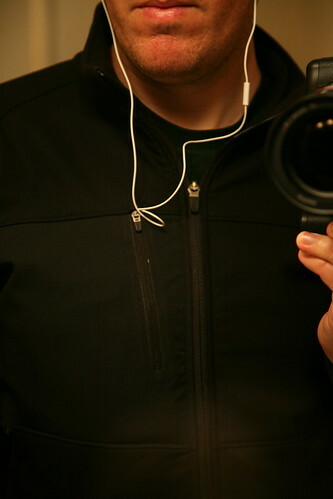 Photos are fun and look great, movies are nice and will work great on planes, and the iPod functionality looks good. The thing that really knocked my socks off was Safari. I do almost everything in a web app, and even with my blackberry pearl I was stuck with a crippled browser that could only use about half the apps I need. It was a breakthrough over my last device (which was painful for more than 1 or 2 web page views) but I never thought having a full copy of safari on a phone would be so liberating (especially since I only use firefox on my mac). Usually before I go to bed, I have to sweep through half a dozen sites and apps to make sure everything is on the up and up. I learned that I could do everything on the iPhone, and I could do it from anywhere on earth. This is going to be great for airports and other places where I used to feel bored, trapped, and in dire need of internet access. So in conclusion, the iPhone is nice from start to finish, but Safari is really the thing that turns it from a phone into a mini-laptop. Once I get more used to two-thumb typing, the last limitations that keep it from feeling like a real computer will be gone.